Do you use Google Classroom? 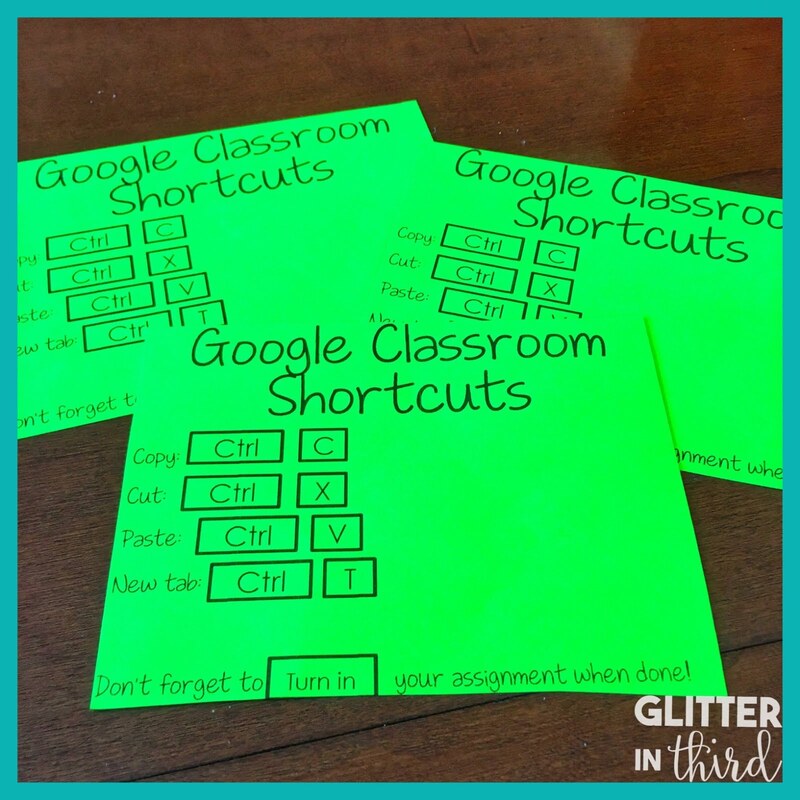 I try to incorporate Google Classroom into many aspects of my day, because it keeps the kids super engaged, gives kids practice with technology, and decreases teacher prep time. 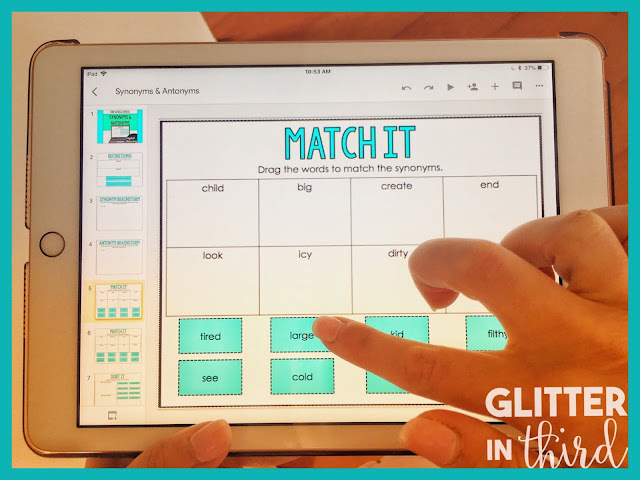 Today, I am going to explain how literacy stations fused with technology work best in my classroom. Will this work best in your classroom? It may, it may not. You may take a few ideas from here and try them out. There are so many ways of implementing technology in reading that it can be trial and error regarding what works best for you! However, this is what was successful for me and my students and I want to share with you. Do you currently do some type of literacy stations - whether it's rotations, Daily 5, or small groups? If so, using a technology station will work perfectly for you! You do NOT need to be 1:1 to get the benefits of using devices in the classroom. It's super simple to plug a technology station into one of your rotations, and only having 4-5 kids working on a device at one time. Why use reading technology in the classroom? Previously during literacy stations, I would always end up with a big stack of papers to sort through, or a stack of composition books that I collected to check for accountability purposes. What do I like most about Google Classroom? It will dramatically cut down your prep time. You simply click "assign to students," and you're done! Students no longer can lose their work, or accidentally take it home. No last minute runs to the copy machine. 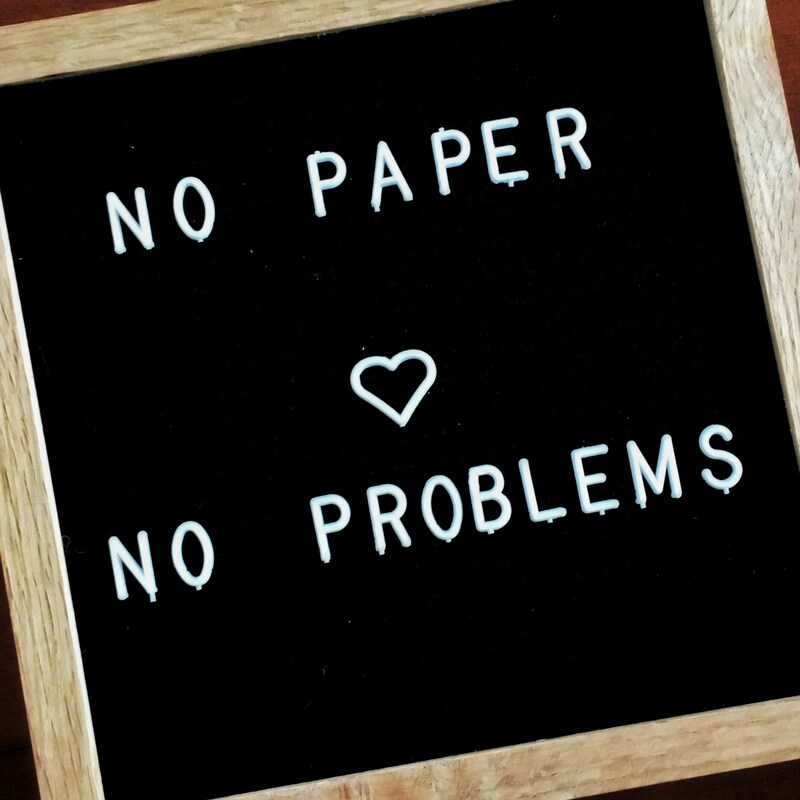 No piles of papers all over your desk. It also keeps all of your students' work in one spot on a cloud-based account. Google Classroom creates a Google Drive folder for each student AND a specific assignment folder. Google Classroom also tells you which assignments have been completed by each student. Do I use technology activities for students in every subject? I personally do not think that every part of the school day should include technology. I believe that students need a balance of hands-on learning and concrete thinking. For example, I teach cursive handwriting. We use math manipulatives. We use math worksheets. We cut and glue interactive notebook foldables. However, I like to think about my day and decide where we could utilize Google Classroom so that my kids get to use it daily, but still get that hands-on learning experience and are not staring at a computer screen all day. How could I get students using an Internet resource a few minutes a day that would be a valuable use of their time, and not just an insignificant add-on? I found that utilizing technology during my literacy stations was a perfect fit. 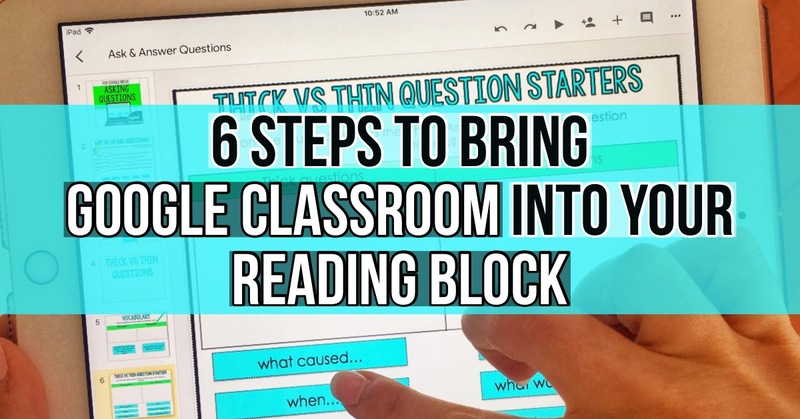 Want to save time creating reading technology in the classroom? My Reading for Google Drive Bundle contains all the reading strategies and skills that your students will use all year long. 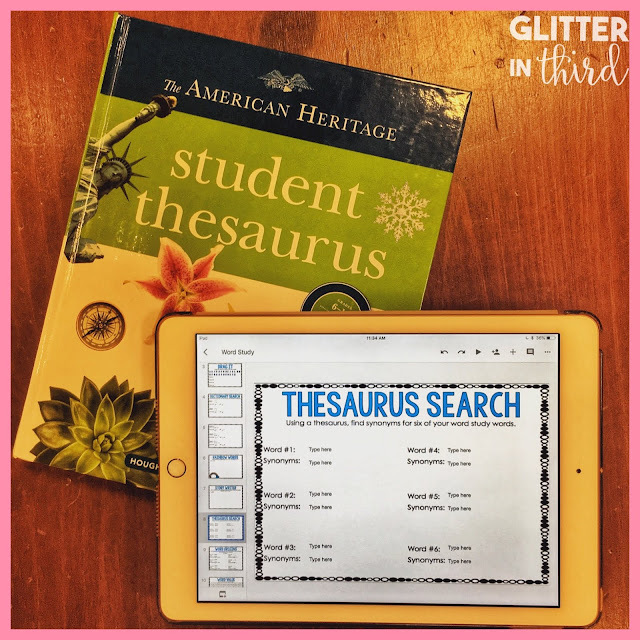 There are plenty of activities for students to complete, but also graphic organizers that students can use again and again all year long with different texts! 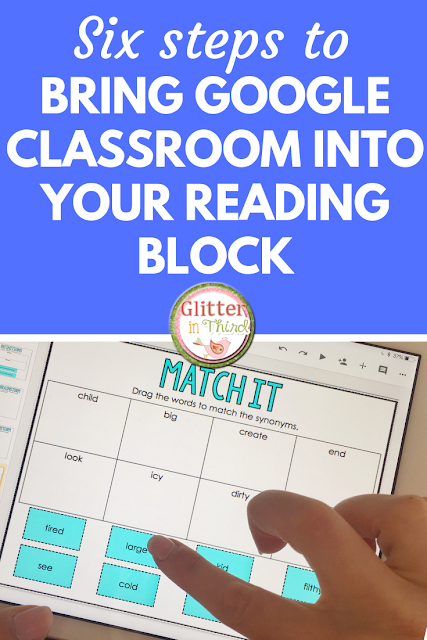 I also offer a reading Google Classroom freebie on my Teachers Pay Teachers store! This is great if you're trying out Google Classroom for the first time. It contains a sample for cause & effect, character traits, inferences, and main idea! I love literacy stations because I love teaching small groups. I see the most growth occur in small groups, and I prefer to meet with each group every day. Of course, what are the other students doing while the teacher is meeting with a small group of students? In my classroom, we are doing literacy stations. We always have an independent reading station, a technology station, and a reading comprehension station. I wanted activities that were consistent so I would not have to constantly explain directions to students. I wanted students to rotate. I wanted a variety of activities to keep students engaged. I wanted to minimize any prep time. I settled on having four literacy stations that my students rotated through. Here are the four components of my literacy stations. Each station is approximately 15 minutes each. Today, I will be focusing on the technology station and some ideas that you could implement during this time. Keep reading to learn how I use Google Classroom in my literacy stations! You will need a Google Classroom page. A Google Classroom page is free! Each student will use your unique Classroom Code on their Google Apps account as well in order to get onto your classroom page. Unfamiliar with Google Classroom? Read more about it in my blog post here. What do I do if I finish my assignment early? (I keep it basic and have them read if they finish early). How do I turn in my assignment? 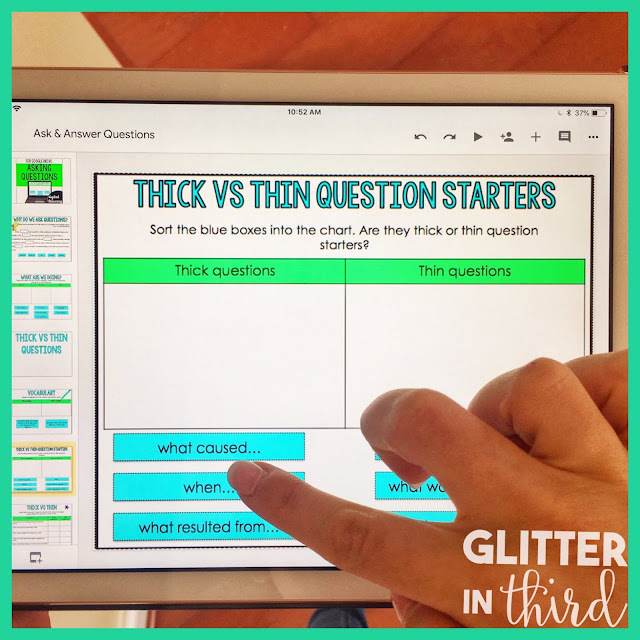 We go over these questions, and as a class create an anchor chart together. This anchor chart is posted in the room so that it is easily accessible to students. Go over how to log on and other questions as a group BEFORE starting Google Classroom. Practice using Google Classroom whole group on the SmartBoard. Practice in small groups. The more guided practice that students have, the more likely that they will successfully navigate it on their own. I also do a few activities whole group. This gives kids the understanding of what is expected from a text response, a short answer, and a drag-&-drop question. What reading strategies do you teach at your grade level? In my third-grade classroom, we work on author's purpose, asking questions, cause & effect, character traits, compare & contrast, dictionary skills, fact & opinion, inferences, main idea, making connections, homophones, roots/prefixes, reference materials, syllables, making predictions, sequencing, story elements, summarizing, and synonyms/antonyms (I attached links to my Google Drive products for each of these skills). We practice these reading and language skills all year to ensure that we master them by the end of third-grade. Will this be new material you are having students work on during this literacy station, or spiral review? I personally like using spiral review in my literacy stations to practice skills that my students know, but are still in the process of mastering. After all, practice makes perfect! I like to think about what my students already learned in the year, and incorporate that into their literacy stations. This avoids the situation of learning about sequencing in October, and students completely forgetting it in May. You may also notice during your guided reading what areas that students are struggling and choose to assign the activities that focus on that skill. For example, during guided reading I may notice that my students are struggling with cause & effect. Use your technology literacy station to give students practice with this skill! Need to differentiate? In the typical classroom, your students will struggle with different skills. Google Classroom makes it easy to differentiate because you can assign students different work with the click of a button - and they have no idea that their work is different than someone else's work! You can assign your groups a different set of skills. One group could work on inferring, while another group focuses on summarizing. Need ideas regarding what kind of activities to create and assign to students? Think about different organizers that you could make. You could create a t-chart for students to make predictions as they read their text. Students could compare and contrast characters in their text with a venn diagram. 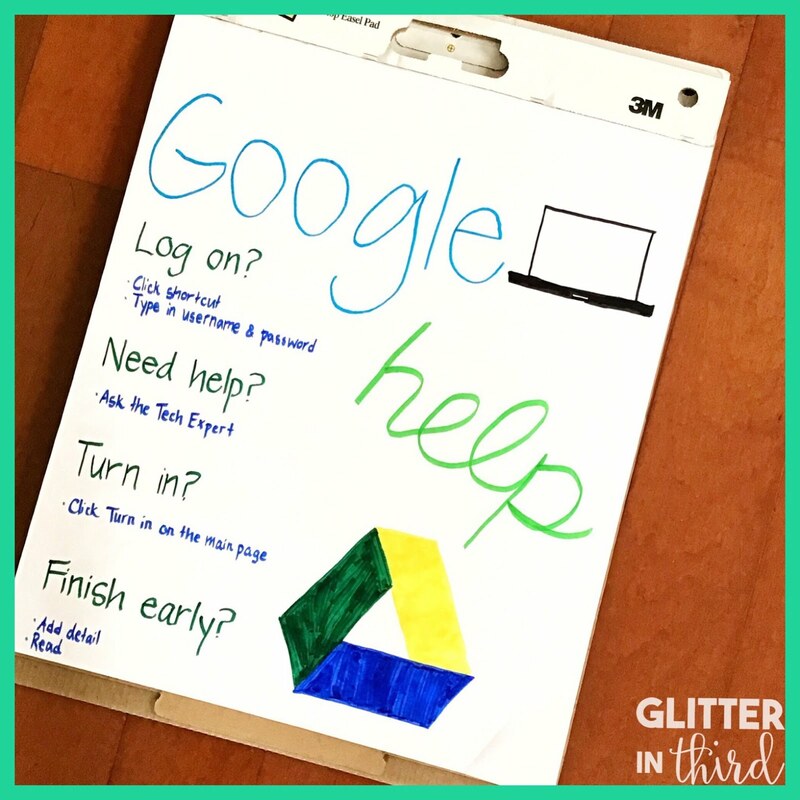 Think about charts or graphic organizers that you would use on paper, and create these for Google Drive. 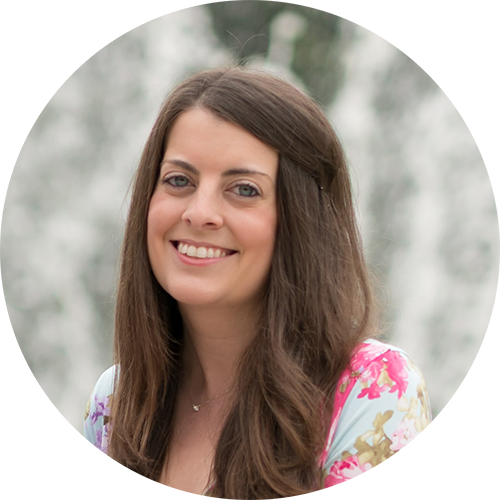 To save time and have a huge variety of resources to choose from, you can check out my Reading for Google Drive product - click here! I assign a slide or two with the skill that I want them to practice (click here to learn how to assign individual slides!). Choose or create an activity that you want students to do, then click "Assign." Done! Need help with how to assign? Make sure to check out my blog post for easy step-by-step directions and pictures. This is the fun part! Students log in, then get to work on whatever you assigned them. Google Drive products have so many possibilities - from students brainstorming their answers, interacting with and moving pieces around the screen, or filling out a chart using their book. As usual, there are always going to be moments that a few of your students are confused or don't know what to do. There are two ways that I help with this. I like to have these "Google Classroom shortcuts" on hand in a spot that students can easily peek at. I print, cut, and laminate these. Then, you can take them to the laptop, desk, computer stations, etc. It makes it nice and easy for students to remember those computer basics! We also have three classroom "tech experts" every week that kids can go to if they need help. Usually if a student is stuck, there is a very easy fix that another student can help them with! This way, students know who can give them some assistance, which let's you focus all your attention on your guided reading group! Your Google Classroom will tell you which students have or have not finished their work. No more shuffling through papers trying to figure out which kiddo didn't turn their work in! What do you think? I hope you found this helpful or got an idea or two that you think you could use in your own classroom! Do you use technology in your classroom? Using Google Slides, you can easily create and assign assignments daily to your students. Want to save time? 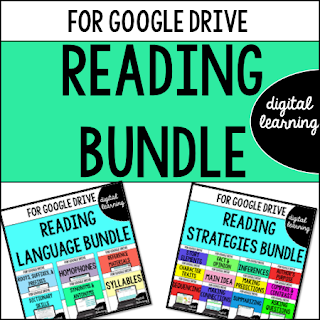 I have a Reading for Google Drive Bundle product available that you can easily assign to students! If you're unsure about making the leap to buying a product, I also offer a Reading for Google Drive Sampler Pack for you to become familiar with Google Classroom and see if would work in your classroom!